The Mercedes-AMG Project One isn’t a head-turner, unless you pull a double take because it looks like a mutated fish. But that doesn’t mean it’s not effective. No, no, no, this car isn’t meant to look good. It’s meant to go fast and glue itself to the ground, which is why AMG claims it makes NASCAR levels of downforce. 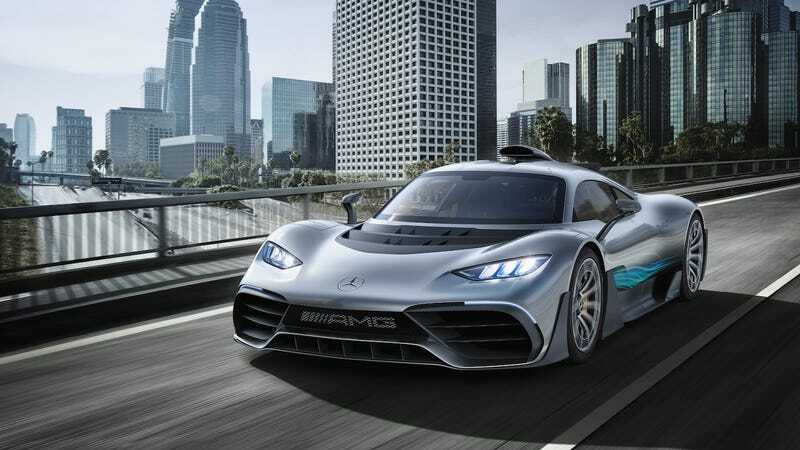 AMG boss Tobias Moers said the downforce generated will be “approximately half the weight of the car” and confirmed that the Project One will weigh between 1300kg and 1400kg ... Taking the 1350kg midpoint, this would indicate that the car will likely produce around 675kg of downforce, which would fall short of the Senna’s 800kg claim but appears impressive given the Project One’s sleeker shape and less prominent active rear spoiler. Since AMG didn’t specify what speeds this downforce figure is coming from, it’s likely that the car’s max downforce is around that 675-kilogram mark. While it doesn’t reach the reported levels of the new McLaren Senna, that’s still a huge amount of aerodynamic force on a car with a front grille that looks, even at a standstill, like it’s sucking a whole bunch of wind into its cartoonish fish mouth. So, yeah, the Project One is fast! Perhaps AMG made it that way so it could run away from its own reflection.